"Always DO the RIGHT Thing!" "How hard is it to Do the Right Thing? IT'S NOT, SO DO IT!" 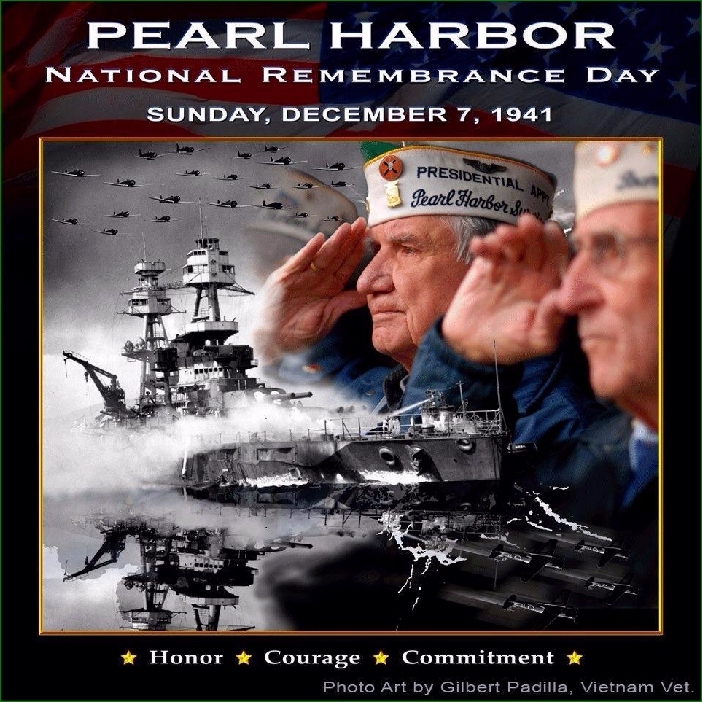 Honor, Courage, Loyalty, Discipline, Honesty, Integrity, Benevolence, Politeness, Respect, Sincerity, Commitment and Self-Control! Katrina "The Storm" Nahe First To Register For 2013 IKF World Classic!! The year hasn't even ended and there is already some action towards the IKF Tournaments for 2013. 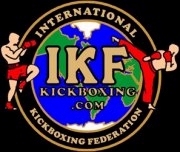 To begin with, any fighters looking to be the first fighter registered for next years 2013 IKF World Classic, well, that position is already taken. Multi time World Classic Champion and IKF Junior Amateur World Champion Katrina "The Storm" Nahe got all her paperwork in here on December 10th! Nahe is from Antioch, California and is trained by Dennis Guila. She holds a record of 8-0 with 3 wins by KO/TKO. For the 2013 Tournament she registered in the Junior Girls International Rules Division at 115.1 - 120 lbs. Katrina won the IKF Junior Girls Amateur Muay Thai Rules Bantamweight World title on May 5th, 2012 in Oakland, California on one of Johnny Davis' AKPromotions Events. 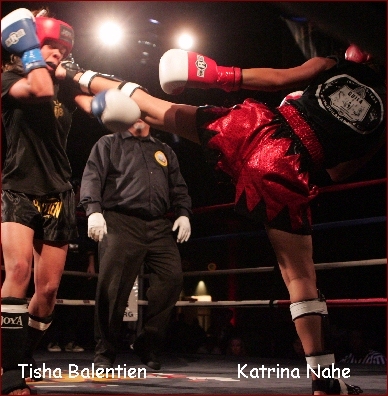 Katrina defeated Tisha Balentien of Almere, Holland (34-6-1/11) by unanimous decision, 49-46, 48-47 and 49-46 (Bout photo at right). Last year Balentien's trainer and mother said they wanted to make the trip to Orlando to rematch Katrina, however they never did. This early registration by Katrina though should give Tisha plenty of time to plan for the trip. Their World Title match was a barn burner that a lot of people would love to see again, but doubtful anyone would travel all the way from California to Orlando to see it... Also keep in mind if there are other fighters in their division, both would need to win their way through the bracket to meet on Championship Sunday! 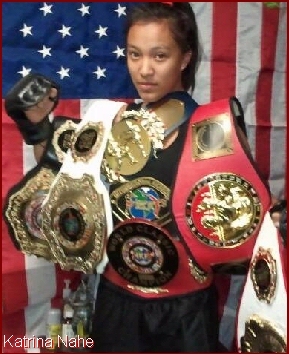 Katrina has won "3" IKF World Classic Tournament titles (2007, 2009, and 2011) and last fall she won the title at the 2011 IKF International West Coast Classic in Sacramento, California, USA. Both tournaments are in there own way, similar to the Golden Gloves tournament for boxing. In 2010 she won the IKF Junior Amateur Girls Western United States title on the scales when her opponent Aneka Otto of Scottsdale, Arizona failed to make the 105 weight, weighing in at 107. However, to prove her worth, Nahe fought her in a non title bout anyway, and won by unanimous decision, 39-37, 39-37 & 40-36. So Katrina is First, the question is, "Who will be NEXT!?" Are you ready to "Walk the Walk" at this years 2013 IKF World Classic? Don't wait to see the new belt design for this year as by the time we present is (As Always) it may be too late for you to register. Keep in mind the "FIRST DEADLINE" this year is May 24th, 2013. The Final Deadline is July 2nd. To see all the Deadlines for the 2013 IKF World Classic, click HERE! 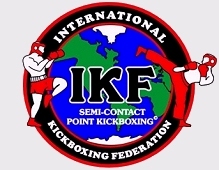 Years ago there use to be several IKF "Regional" tournaments for the fighters to fight at for a better seeding at the World Classic. So far there is only 1 regional scheduled, the North Central Regional in Beloit, Wisconsin, on March 16th, 2013. Although called the "North Central", fighters from anywhere can attend, including fighters from Canada. For details on this event click HERE. Still open for Regional Tournament Scheduling are the South East, North East, South West, Central West, North West and of course Central USA. If you know of a promoter who may be interested in hosting an IKF Regional Seeding event, have them (or you) call the IKF or e-mail the IKF. Word has it that the IKF has been in talks with AK Promotions Johnny Davis (Now living in South Carolina) has an interest in doing an IKF East Coast Classic tournament. Whether the event will be a Regional Seeding tournament like the North Central, or a belt tournament such as the 2011 IKF West Coast Classic (Click) has yet to be determined. Chances are, if a "Regional Seeding " tournament it will of course be in the Spring (March - April). If a "Belt" style Tournament as was the West Coast Classic, it would most likely be in the Fall (October, 2013). 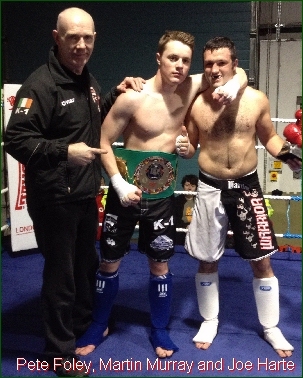 IKF Promoter Mr. Billy O Sullivan ended the year with the last IKF Sanctioned event of 2012. 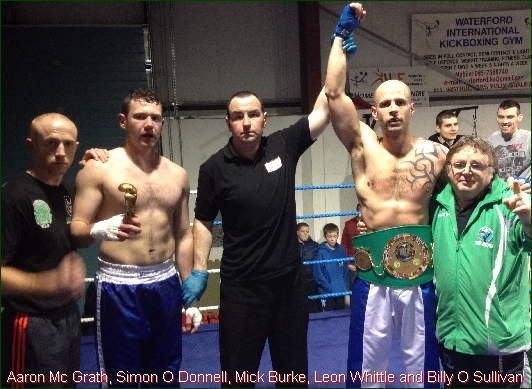 The event was held in the Northern Extension in Waterford with an exciting fight card that saw two new IKF Champions being crowned. A couple of fights on the undercard were cancelled due to circumstances beyond the promoters control but the fights that went ahead more than made up for it. Mr. O Sullivan wants to thank all the fighters, coachs, officials, set up/down crew, parents, fight fans, medical staff, sponsors etc and anybody who helped make this show and indeed, all of his events this year, for all their help and support and wishes a Happy Christmas and peaceful new year to all. Bradley Kirwan (Waterford) defeated Scott Massey (Tipperary) by unanimous decision, 20-18, 20-18, 20-18. Judges: Patrick Ryan, Pete Foley, Howard Vincent. Denis Timerov (Waterford) accidently injured his knee against Jack Power (Deise) and the fight was deemed a "no contest". defeated David Quirke, (Tipperary, Ireland, 0-2, AB: 1-0, 71kg, 5'8'', 06-18-78, Craig Sutton, 087 9682833) by TKO at 1:30 of round one. IKF Ireland recommend a 30 day medical suspension for David Quirke until January 15, 2013.
defeated Tammy Kenny, (Cork, Ireland, 0-1, 62kg, 5'7'', 03-03-77, Darren Cashman, 085 2784970) by TKO at 1:00 into the first round. 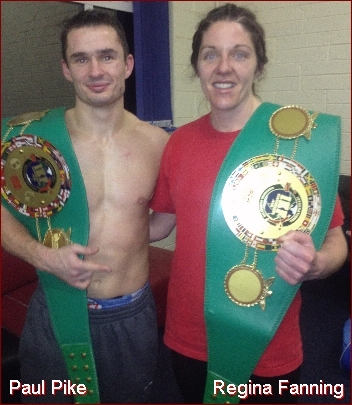 IKF Ireland recommend a 30 day medical suspension for Tammy Kenny until January 15, 2013.
defeated Joe Harte, (Waterford, Ireland, 1-2-4, 72kg, 5'8'', 07-14-81, Billy O Sullivan, 085 8589902) by TKO at :40 seconds into round three to win the title. IKF Ireland recommend a 30 day medical suspension for Joe Harte until January 15, 2013.
defeated Sarah Kiely, (Kilmacthomas, Ireland, 5-2, 56kg, 5'4'', 03-18-93, Vinny O' Brien, 083 4218676) by unanimous decision. 30-27, 30-27, 30-27. Judges: Patrick Ryan, Pete Foley, Craig Sutton. defeated Simon O Donnell, (Athlone, Ireland, 4-3 kickboxing/3-1 boxing/ 5-0 mma, 88kg, 6'1'', 02-03-89, Aaron Mc Grath, 085 1328205) bt TKO at :45 seconds into round two to win the title. IKF Ireland recommend a 30 day medical suspension for Simon O Donnell until January 15, 2013. This was an excellent contest between two worthy challengers. Although Moir was the more experienced it was Young who forced the pace from the outset. 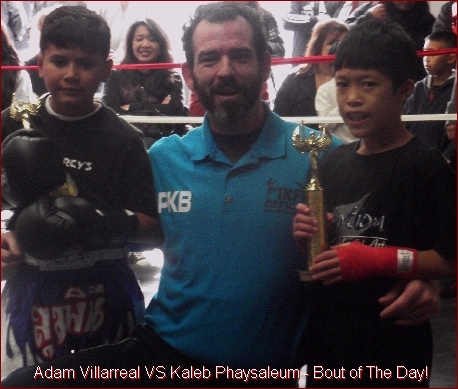 Both men had similar classic Thai styles and although the rounds were fairly even, it was Young who had the edge for most of the contest. There was a lot of trading but neither man looked in trouble at anytime as defences were rock solid. However Moir was repeatedly warned for accidental low blows. This eventually cost him a point deduction in the 4th round but by that point Young was ahead by a comfortable margin and at the final bell the decision was just a formality. 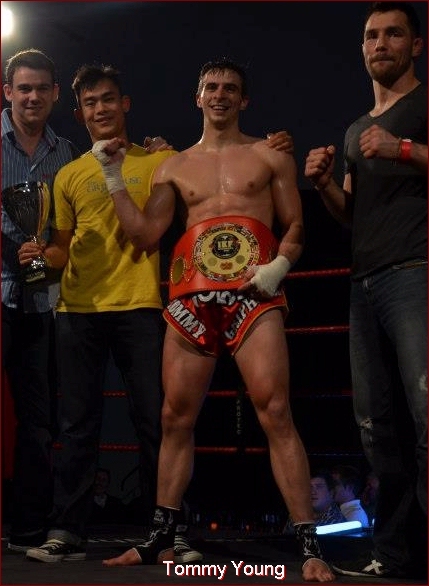 Congratulations to new IKF Champion Tommy Young. WINNER: Tommy Young by unanimous points decision: 49-47, 49-47, 50-46. NOTE: Only this title bout was sanctioned by the IKF on this event. Newly appointed IKF Midlands Area Representative Pat John Mc Cool, hosted yet another successful and exciting Full Contact Kickboxing, IR and K-1 promotion in the Sarsfields GAA Centre in Thurles on Saturday night. The card featured no less than three IKF All Ireland Title fights and the show went off without a hitch. IKF AMATEUR FCR ATOMWEIGHT "EXHIBITION"
and Majella Connolly, (Thurles, Ireland, 0-4-1, 62.8kg, 5'7'', 1-30-82, PJ Mc Cool, 087 9359123) fought to a draw. 29-27, 27-27, 29-27. Judges: Patrick Ryan, Tony O Donnell, Owen Doyle. defeated Connor Broderick, (Thurles, Ireland, 7-10-1, 52.3kg, 5'7'', 11-25-94, PJ Mc Cool, 087 9359123) by unanimous decision. 27-29, 26-30, 26-29. Judges: Patrick Ryan, Tony O Donnell, Vinny O Brien. defeated Gerry King, (Galway, Ireland, 2-2, 71kg, 5'9'', 2-2-75, Pete Foley, 087 8119227) by TKO 45 seconds into the 3rd round. Gerry King has been issued a 30 day medical suspension for until 31 December, 2012 by IKF Ireland. defeated Derry Guinin, (Offaly, Ireland, 1-2, 92kg, 5'10'', 3-29-89, John Quigley, 086 6660474) by majority decision. 29-28, 29-29, 30-29.
defeated Daniel Mullaly, (Kilkenny, Ireland, 2-4, 63.5kg, 5'10'', 8-13-96, Mick Bland, 087 6118301) by TKO at 45 seconds into round two. Daniel Mulally has been issued a 30 day medical suspension for until 31 December, 2012 by IKF Ireland. defeated Brian O Donaghoe, (Kilkenny, Ireland, 5-1, 73.5kg, 5'10'', 3-20-80, Mick Bland, 087 6118301) by unanimous decision. 30-28, 29-28, 30-28. Judges: Patrick Ryan, Billy O Sullivan, Vinny O Brien. defeated defending champion Amy Wilson, (Donegal, Ireland, 18-14-2, 64kg, 5'6'', 12-3-80, Joe Wilson, 086 8774382) by majority decision. 49-47, 49-48, 49-49. Judges: Patrick Ryan, Owen Doyle, Vinny O Brien. defeated Dan O Connor, (Limerick, Ireland, 8-3, 60kg, 5'10'', 7-17-96, Tony O Donnell, 061 368608) by unanimous decision. 49-47, 49-47, 49-48.
defeated Tomas Trajkovski, (Kilkenny, Ireland, 4-4-1, 64kg, 5'8'', 10-6-86, Mick Bland, 087 6118301) by unanimous decision. 50-45, 50-45, 50-45.